This course will help you gain an understanding of the power and application of Virtual Reality Development with Unity. Many executives and managers are interested in understanding what VR can bring to their business, what is possible, and especially what resources are involved in developing content for VR. 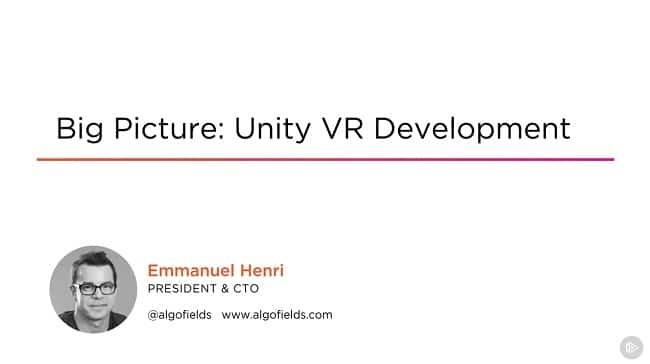 In this course, Big Picture: Unity VR Development, you'll get a high level overview of all these aspects. First, you'll get to see some samples of Unity projects which demonstrate the concepts of 3D space. Next, you'll see some examples of industry specific VR in use. Finally, you'll leverage the sample VR project to demonstrate what the basic pieces are for such a project, as well as a discussion on what skills and Team members are needed for these types of projects. When you're finished with this course, you will have a thorough understanding of what is possible for VR development with Unity. Required software: Unity 2018.